Every garden has its own song. 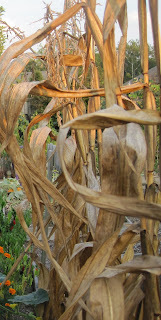 In my garden, the corn stalks long ago dried up but I like to leave them standing so I can listen to the rustling sound they make when the wind blows one stalk against the other. Elsewhere in the garden, I can hear the birds calling out to one another – cardinals, robins, goldfinches and all kinds of other birds that I don’t know all that well. They often start their singing early before the sunrise. You would think that some mornings, it is their loud singing that causes the sun to rise. In the late summer evenings, I listen to the whirr of the cicadas in the trees and the chirping of the crickets, hiding out wherever it is they like to hide. They are joined throughout the day by the buzzing of bees, moving from one flower to another. A small fountain in front adds to the garden song with the soothing, cooling sound of water. Sometimes, after a heavy snowfall, the garden rests in silence, the snow muffling the sounds of any creatures brave enough to stir in the cold. Those days remind us of how empty and cold a garden can seem when there is no sound. It is quite eerie. Sound, as it turns out, is an important garden design element. You never see it, but you miss it if it isn’t there. I call this garden design element “garden song”. When I read about adding sound to a garden, I mostly find information about adding the sound of water to the garden, or see ads for music speakers that are disguised as rocks. I’m happy to add the sound of water because that would draw more song birds to the garden. But I’ll skip the music speakers, and I probably won’t add any wind chimes, either. I’ll just add a diversity of plants and bring the garden design element of garden song to my garden that way. I love the sounds of nature out in my yard but had never thought of it as a song. Now I won't be able to think of it any other way! It is the first time I read a post on sounds in the garden. are also part of the whole. An ingredient that most do not appreciate or pass by. Whenever I talk about ornamental grasses, I mention sound as one of the attributes. My hearing is not a sharp as it once was, but the sounds of the garden remain important. When we lived in China we learned that one of the reasons bamboo is so important in gardens there is because of the music they make in the wind. What a beautiful way to look at the sounds of the garden. We have a koi pond with a waterfall, bird baths, bird feeders and flowers. Our garden has a beautiful song of its own! Setting in the garden with my eyes closed and and just listening is my favorite way to unwind after a day at work. After a bit I'm then able to truly enjoy the visual pleasures of the garden. Great post...and such a valuable reminder to all of us to slow down and take a moment to enjoy the sounds of nature around us! The farmers here are growing less corn...replaced by alfalfa hay on one side and soybeans in the surrounding fields, but I think you captured the feel that the cornstalks of September give the countryside. recently the bird songs here have changed... that is one of the songs that clue me into the seasons changes. All the senses are important in architectural design. At least that is what we are taught in school. But in the real world, much of the ephemeral and childlike nature of that gets lost. It is just a fleeting thought, but the ironic part is, that brief whiff of freshly cut hay in the field, that rush of a babbling brook around you feet, the sound of gravel under foot on a mountainous path, brings back memories from a long ago, possible happy time. That is the magic created in design if that feeling can be captured and expressed in a space. Your words truly said what designers strive to create, something more than the physical space, but the sense of the place. It is the same in designing gardens. Good garden design evokes a feeling. And sound is really an important element to the effect. A very good post. I've always noticed sound and motion as important garden design elements. Waterfalls are the most common element around here for providing both. I too will do without the wind chimes. They often just cover up and distract from the natural sounds. 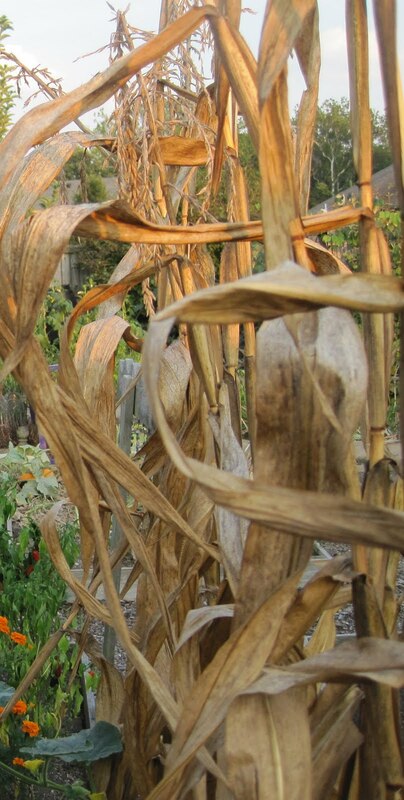 Along with the pines that surround my yard and garden, the dried up ornamental grasses make a wonderful "mountain sound" as the breeze blows through them. As well as visual interest, I leave them until Spring for the sound and motion as well. A wonderful mention and reminder of this often forgotten design element. Thank you. Yes to garden song. No to garden speakers. Now if I could just convince my husband. I always get up very early in the morning. I go in my garden, to look, to feel and to listen, everyone is asleep and me ? In enjoy the sounds in the garden also, especially with a nice breeze. And second best is being indoors with the windows open and hearing the sounds from outside. Carol - what a profound observation! It really made me think about that... the cicaidas, the crickets, the birds - their happy 'clucking' right now as they feast on our crab apple tree and even the wind through the pine tree! We visit Colorado regularly - and it's a whole different set of garden sounds: elk calls, hummingbird wings, babbling brooks. What a wonderful way to look at gardening!